Back to school is a great time of year for parents, but for single parents, there is a burden of extra expenses to prepare for school. Back-2-School giftings of backpacks and Kohl's cards are scheduled for August. You can sign up now to join the team or sign up to receive a backpack beginning in July. 250 backpacks filled with grade-appropriate school supplies for kids entering K - 12 will be handed out at TerraNova Church. Sign ups will begin in July for families in our our service area. 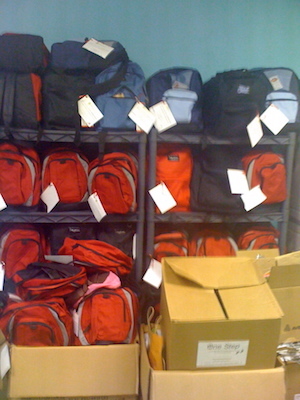 You can make a difference by helping pack these backpacks! One Step Ministry provides Kohl's gift cards for each child of One Step Active Participants.